How're you gorn on bor? Crudely translated as How you getting on, mate? Norfolk. The arse of England. Firstly, 5 interesting historical facts about my fine city and cultural hub of Norfolk - Norwich. 1. Norwich could have been the capital of England. (In the 11th Century London and Norwich were the two biggest cities in England). 2. The Norwich Post was England's first provincial newspaper, published in 1701. 3. Norwich was the first place in the UK to have postcodes. (They tested them out here and began testing an electronic way of sorting through all the post). 4. Norwich Cathedral has the second tallest spire in England. (Only Salisbury Cathedral has taller). 5. The Wild Man Pub is thought to be named after a feral child who mysterious tuned up in Norwich in 1751. A quirky, seaside town on the North Norfolk Coast. Famous for its sandy beach, iconic pier complete with theatre, towering lighthouse and delicious locally caught crab. The town is awash with local independent shops, has a strong tradition with the RNLI service (Royal National Lifeboat Institution) and plenty of places for a bloody good Ice-Cream. Rum & Raisin if you're asking? Must See - No.1 chip shop. If you can grab a table in the sit down restaurant you'll be in for a treat with stunning, uninterrupted views over the pier and beach. Mentioned in the Michelin Restaurant guide for 2017, be sure to order the cockle popcorn and mushy pea fritter. Yum. An area reflecting the true history of Norwich. Cobbled pedestrian lanes and alleyways where you will find eclectic independent retailers, quaint pubs, curious entertainment venues, art galleries and the award-winning Ter Dolen Kriek (Cherry Beer) served at the Belgium Monk pub. Oh, and don't forget the medieval castle standing lordly over the city centre! Must see - Moosey Art. A contemporary art gallery showcasing some of the world’s leading street artists, as well as introducing up and coming talent. Known for pop up exhibitions, it's ever evolving curation is a feast for the eyes. For those with children out there. A wild and imaginative adventure park bought to life from Tom Blofield's book - Boggle at Bewilderwood. Think outdoor forest fun with tree houses, zip wires, jungle bridges and a boat trips. Voted best outdoor play area in 2015. World renowned (even mentioned in a Bowie song) rivers and lakes covering 117 square miles. Ideal for a day boating or for the twitches out there, a chance to glimpse the elusive marsh harrier. Keep the energy levels up and stop off for a pub lunch at one of the many riverside pubs. A 15th century stately home steeped in history and linked with Anne Boleyn (even said to be haunted by her - Ooooooh). Transport yourself back to the 1930's with a tour around the house taking in the former owner Lord Lothian's grand settings, portraits and photos. Be sure to visit on a sunny day to appreciate the gardens and park in all their glory. A quintessential, picturesque Norfolk town. Dubbed Norfolk's loveliest village and known as 'Chelsea-on-sea'. Elegant brick and flint Georgian cottages all cluster around a central green. Stroll around the area take in the wonderful architecture and visit the high street for speciality local shops. Gurnery Fish shop produces the best locally smoked fish around. Birdie Fortescue's - The Kitchen is a great place for fresh pastries, cakes, quiches and soups. Set in a Scandinavian style balanced with her love for antiques, results in a tranquil eatery with a great ambience. Greeting by the smell of scented candles there are some great artistic home wares to purchase adding a touch of class and fun to your home. The most beautiful stretch of sand in the country, all four miles of it. The big sky meets the horizon giving clear views for miles on end. Soul purifying. Dog friendly and voted the best beach in the UK, a winter walk here will definitely clear away those cobwebs. Owned by the Royal Family since 1862 and a country escape for Queenie. Open to the public free of charge every day of the year you can take in 24 hectares of gardens, set in 8000 hectares of the estate! The house's ground floor used by the Royal's contains some very special silver gilt and enamel all gifted by European Royal families as well as significant family portraits. Must see - The Museum in the old coach and stable block. Holding a unique display of estate history, the Vintage Royal motor vehicles is fascinating. SEALS. Rounding up the beach list and my Norfolk secrets archive, from November to February Horsey is overflowing with literally hundreds of breeding grey seals. A surreal sight and something you shouldn't really miss if you get the chance. Wild nature on the doorstep. Literally. 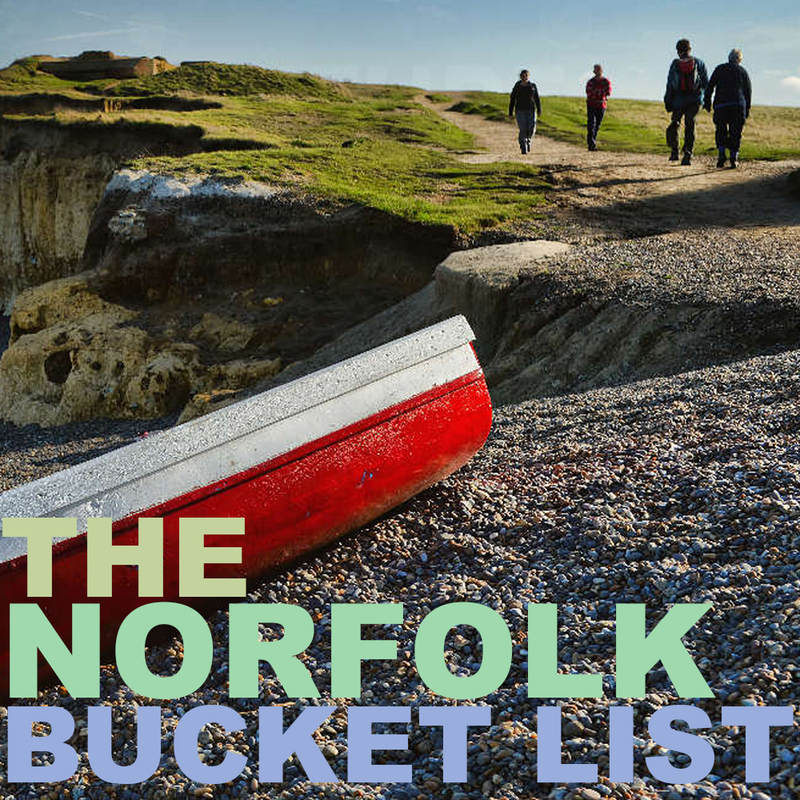 If you know of any under-appreciated areas or attractions in Norfolk.